Feel secure, without annoying sweat stains! With the added "Plus" for the extra protection. manjana® functional bodywear are premium quality undershirts with large integrated sweat protection pads that hinder the formation of sweat stains on outer wear. 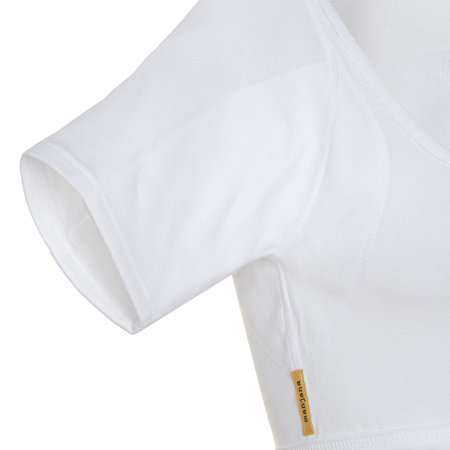 The protection out of 70% polyester und 30% polyamide microfibre absorbs large amounts of underarm perspiration and unnoticable releases it again. For an ideal protection against sweat stains on clothing. The blue Plus offers you an added protection and thus an extra security as it can absorb even more perspiration over an extended period of time. The material of the sweat protection is composed out of a highly absorbing polyester and polyamide microfibre. The absorbed sweat spreads over the entire protection pad and the blue surface dries off again fast so that no feeling of dampness arises. The shirt is fully washable and can be used over and over again with a consistent function ... without the need of a pretreatment or employed additives! Changing or replacing inlays as with other functional underarm shirts is not necessary. The manjana® functional bodywear-collection is short-sleeved to achieve the desired protection results, which can only be obtained with a thoroughly covered armpit region. By using the flatlock-technique the very flat seams don’t attract any attention under outer clothing. Moreover the shirts are characterized by a particularly high level of wearing comfort * with the perceptile "Plus" of protection. The blue underarm protection does not show through to the outside, because it is on the body-facing side! 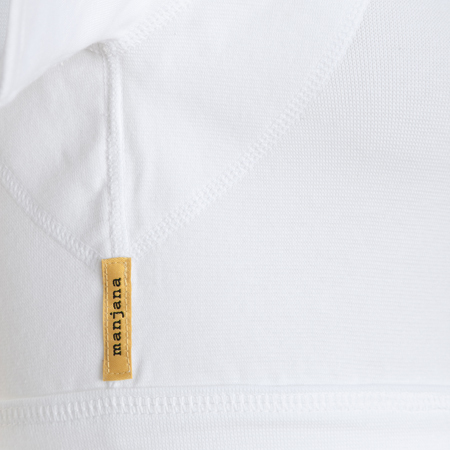 The Plus-shirt is available in white in the proven and popular cut women-U-modern. All shirts in the woman's collection are made out of 95% cotton and 5% elastane. We wish you a new experience of your attractiveness with manjana®! The ladies Round-neck has a very large scooped neckline and is ideal to hide beneath fashionable low-cut necklines. 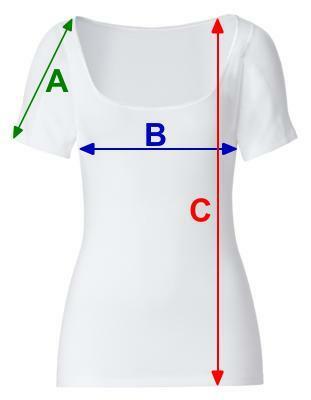 Due to its consistency (95% cotton and 5% elasthane) it is skin-tight, convenient to wear above any bra and almost invisible (flat-lock technique). Protection out of 70% polyester und 30% polyamide microfibre absorbs large amounts of underarm perspiration and unnoticable releases it again. For an ideal protection against sweat stains on clothing. When wearing the shirt for the first time you might feel a "foreign body sensation" underarms. However, this will disappear after wearing the shirt 1-2 times as the protection will adapt to the axillary. Just engage with the preceptible increase in safety! manjana® shirts can be used when suffering from increased sweating. 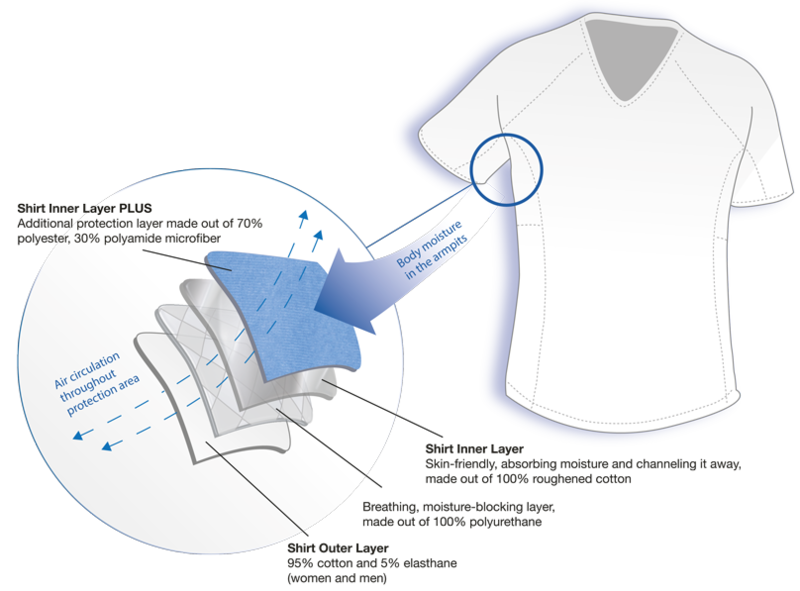 When suffering from excessive sweating, so called hyperhidrosis, the Plus Shirt is recommended or the use in combination with an antiperspirant like for instance SweatStop® Medical Line IXAL Roll-on. Information according to textile labelling law: This shirt consists of 95% cotton and 5% elastane, the protection area consists of 70% polyester and 30% polyamide microfibre (please also see details under heading "Features").